The best way to help a stranded car is by getting your tow straps. Of course, proper knowledge on how to use one is important, too. In general, most tow straps are made of strands of strong nylons with metal hooks attached to both ends. By connecting one of its hooks to a freely moving vehicle, you can easily tow or recover a stuck car. Because you will never know when you will encounter car problems, it is always a good idea to own a tow strap as part of your vehicle’s emergency kit. Most straps that companies manufacture today are small and lightweight. As simple as it seems, tow straps actually come with different functions and qualities. To help you choose the strap that suits your needs, we will provide our best picks. When it comes to tow straps, the combination of durability and flexibility is the name of the game. 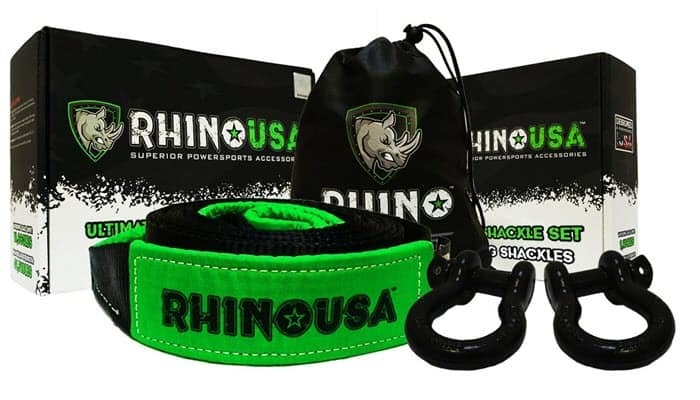 Rhino USA Combo Pack offers the best balance among our picks. Its strap is lab tested and certified to hold 41,850 lbs. break strength capacity. It is strong enough to tow heavy equipment and large trucks. Instead of hooks, it is equipped with heavy-duty D-ring shackles that offer stability while towing. And to avoid rusting, its exterior is powder coated with Chromoly steel. It weighs 9 lbs. and has a dimension of 7.2 x 5 x 2.5 inches. These feats make it very handy, especially when you are saving space inside your car. Its color is a combination of green and black. Without a shadow of a doubt, Rhino USA Combo Pack is the best buy off-road towing accessory available in the market today. 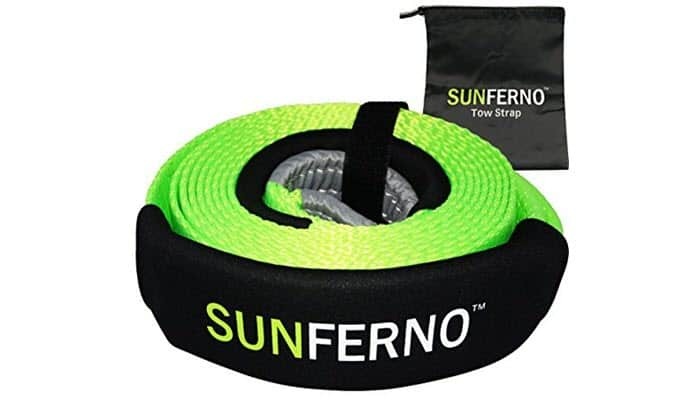 A close second is Sunferno’s Ultimate Tow Recovery Strap. This product has a break strength capacity of 35,321 lbs. This is durable enough to pull felled logs and sizable road debris. In terms of its flexibility, it is also an exceptional recovery strap because of its 10 percent max stretch capacity. Technically, this strap can be used for both towing and recovery purposes. It only weighs 5.82 lbs. and has a dimension of 10.7 x 9.5 x 3.5 inches. Its color is a combination of black and neon green (which makes it extra visible). Additional kits include two protective sleeves, a carry bag, and a wrap tie. These ensure the longevity (and tidiness) of your item. This product is also water-resistant which makes it suitable under different weather conditions. One disadvantage, however, is the lack of pre-attached hooks/shackles. As such, you still need to purchase additional kits to go with the trap. Nonetheless, this multi-purpose strap is worth the buy. 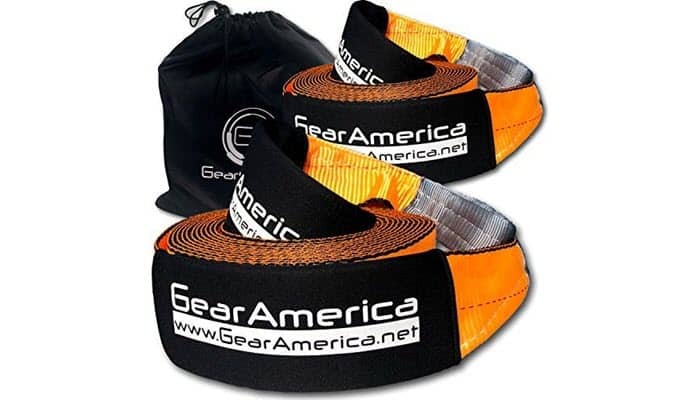 Another great item that you need to consider is GearAmerica’s Recovery Tow Strap. It is also a multi-functional item that can be used as a tow strap, recovery strap, winch extension strap, and tree saver strap. Based on lab tests, it has a break strength capacity of 41,455 lbs. This is really ideal for heavy towing and demanding recovery tasks. Its color is a combination of orange and accents of black. This strap is made of high-tensile polyester making it withstand heavy usage rate and even extreme temperatures (ranging from -40°F to 215°F). It weighs exactly 5 lbs. and has a dimension of 16.4 x 16.3 x 7.8 inches. It comes with a heavy-duty storage bag and a handy Velcro tie to make things organized. Its extra-large loops, on the other hand, makes it free of hassle when linking connection points. It has adjustable protective sleeves that act as padding and reinforcement. Just like Sunferno’s Tow Recovery Strap, the shackles for this brand are also sold separately. 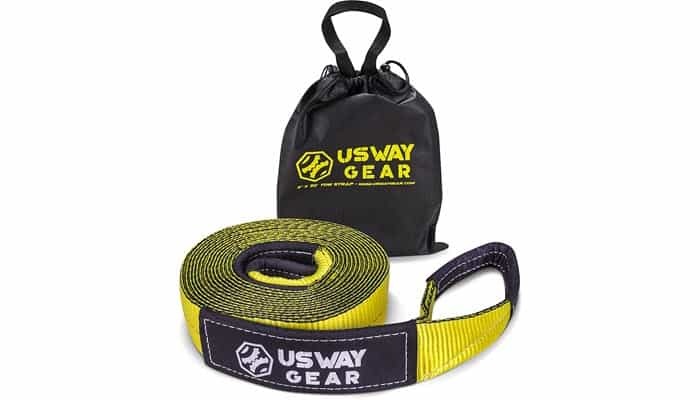 Another great buy is produced by Usway Gear’s Tow Recovery Strap — an American company based in Florida. Their tow/recovery strap holds a break strength capacity of 30,000 lbs and has a working load of 10,000. This makes it suitable for moving light trucks, vehicles, and boats. It has triple-reinforced loops with secured stitching that protects it against tear and abrasion, especially when securing two connection points. It comes with a free storage bag that is large enough to keep extra shackles and attachments. Its color is a combination of yellow and navy blue. This strap weights 4.65 lbs. and has a dimension of 10.7 x 9.3 x 4.4 inches. Shackles are also sold separately from the tow/recovery strap. One of the best perks that Usway Gear offers is the lifetime warranty on their product. 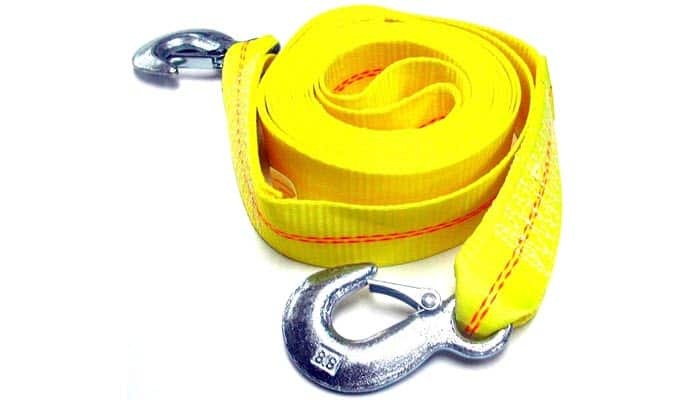 Hardware Factory Store Tow Strap is the cheapest item on this list. While its towing capacity is much lesser compared to the other listed items (with a break strength of 10,000 lbs. ), its functionality is still top-notch. It is certainly capable of towing light vehicles (with a recommended working load weight of 3,300 lbs.). Two safety hooks are also included to secure connection points between two vehicles. Corrosion is also not much of a problem since hooks are zinc-coated. This strap comes in color yellow. And it only weighs 3.11 lbs. and has a dimension of 8.7 x 5.7 x 2.6 inches. It is cheap but it also addresses specific problems which makes it a good buy. This is easily one of the most important categories that you need to consider when buying a tow strap. Each item offers different break strength which also means a different degree of durability and use. While straps with break strengths of around 10,000 lbs. can easily move light vehicles, they also have a chance of snapping or tearing when connected to heavier equipment. One of the things that buyers always consider is the overall kit that goes with the item. While a good-quality strap is always valued, hooks/shackles are also good additions to your kit. They also make the function of your strap more flexible. Different environmental factors affect the quality and longevity of your tow strap. It is always important to consider that buying cheap does not always mean buying wisely. When picking a strap, always consider the condition that it will be subjected. Based on our personal metrics, Rhino USA Combo D-Ring Shackles & Tow Strap takes the title of best tow strap that you can purchase in the market. 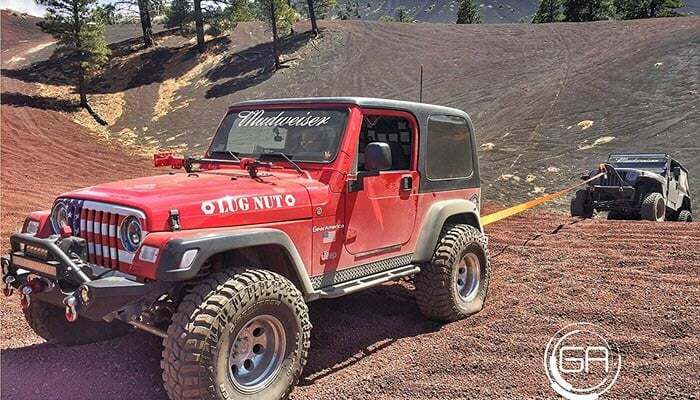 While it is more pricey than other items on this list, it surely offers the best balance of functionality, durability, and longevity than any tow strap can give you.